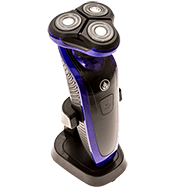 A shaver brand that you may not have heard of before has a unique black and purple design, that is both affordable, and compact. 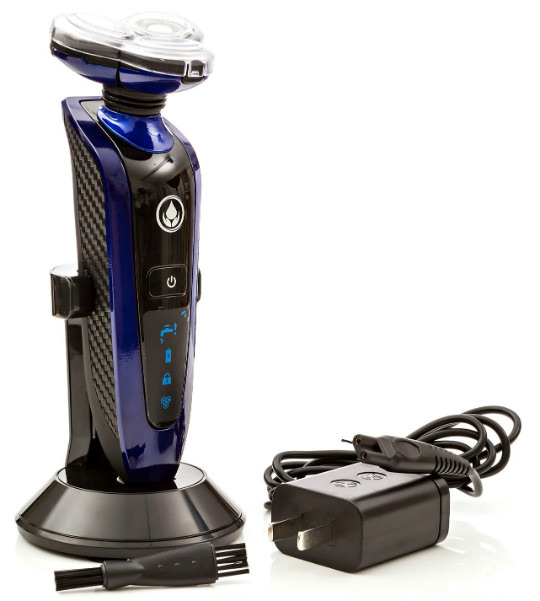 The Creation Springs electric rechargeable shaver is priced around $50, and includes everything you need to have a great shave: shaver, recharger, and cleaning brush. 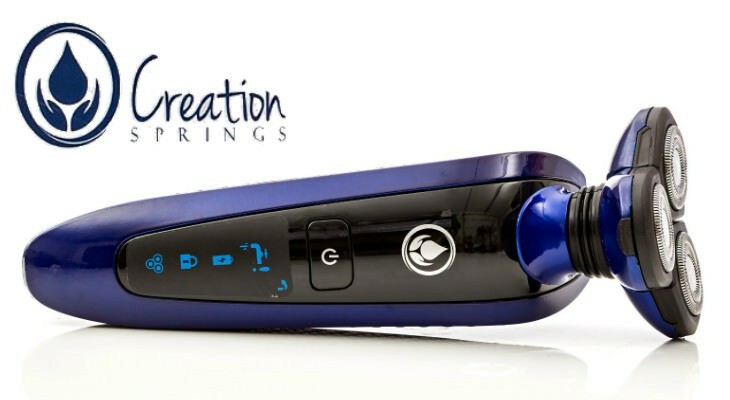 Creation Springs shaver has a rotary-style head with three flat rotating blades. 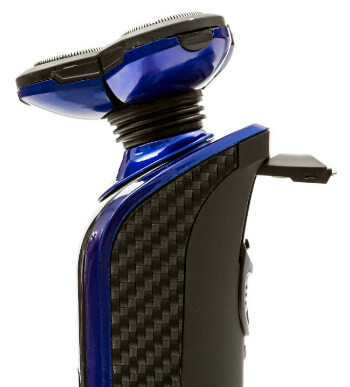 The shaver has a black rubbery casing, making it easier to grip. 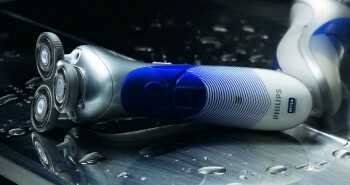 This shaver can be used wet or dry. 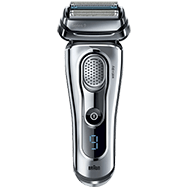 The shaver does a great job when used dry, but when used wet with water and shaving creams or gels, it can trim hair even closer to the surface of the skin. You’ll find that it leaves your face free of stubble, and that you won’t feel any discomfort or redness after shaving. The three rotary casings all pop up, making cleaning easier. You can rinse the head under the tap, shake dry, and it will be ready for shaving by the next day. Each of these shaver heads are self-pivoting. They are made from stainless steel, including the blades, to reduce allergies that men may have to nickel which is often used in men’s shaver products. 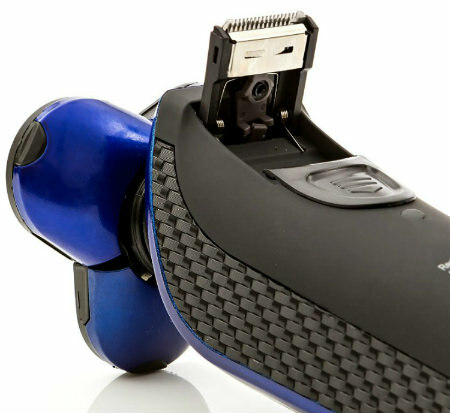 The shaving head is built larger, to help you complete shaving a lot faster than ever before. 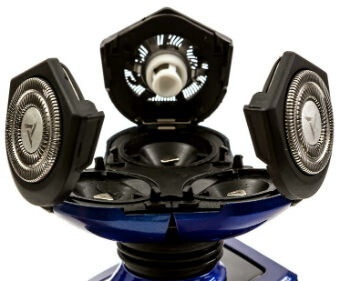 The shaving head is twice as large as other brands of rotary-style shavers. You’ll be able to shave faster, but still have a clean smooth shave. On the front of the shaver is the power on/off button. Underneath is a light up LCD indicator that tells you when you need to clean the shaver, when to charge it up and when the rotary heads need to be replaced. If you’re traveling, there is a lock button so it won’t accidentally turn on while in transit. 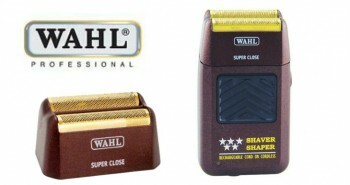 Creation Springs claims that this is the finest shaver in their line. It promises to always be “fully charged” meaning that if you always place it back on its handy charging stand, that it will always be ready to go. The charging stand is compact so you can keep it on the corner of your bathroom counter where the outlet is, and it won’t take up a lot of space. The charger also has three suction cups on the base that grip your counter to keep it from slipping around. 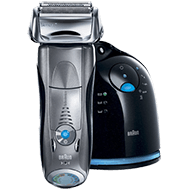 The shaver also has a pop-up trimmer that is an expected feature on all of men’s electric shavers. This is used to trim beards, sideburns, mustaches, and hairs in any difficult to reach areas on the face. It folds back down again after use. The Creation Springs shaver is backed up by a one year warranty. It’s recommended that the shaving head is replaced once a year. 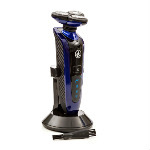 The Creation Springs men’s rechargeable shaver looks like the latest technology, so you can be proud to display this on the bathroom counter, but it’ll also do a perfect job of shaving your face cleanly.